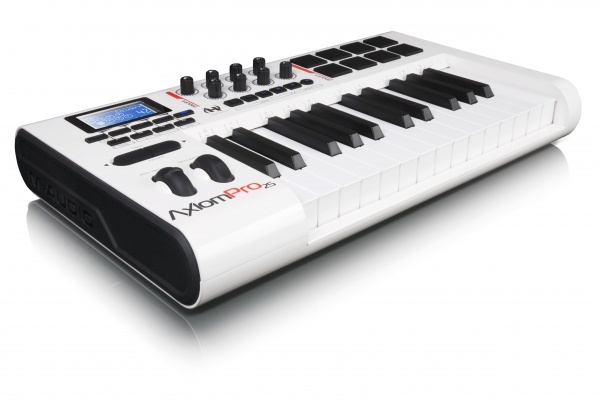 The M-Audio® Axiom® Pro 25 keyboard controller builds on the acclaimed Axiom 25, delivering premium TruTouch™ action, proprietary HyperControl™ MIDI mapping technology and other cutting-edge enhancements in a compact model perfect for tight spaces. HyperControl automatically maps the keyboard’s 28 controls to commonly accessed parameters in digital audio workstations including Pro Tools®, Cubase, Logic and Reason*, as well as software instruments. The constant two-way link with your host DAW means the keyboard’s controls are always in sync with your software’s active parameters. The intuitive graphic LCD constantly updates the current values, which ensures seamless editing and prevents parameter jumps—even when plug-ins are closed. Toggle instantly between Mixer and Instrument control modes. Map buttons to send QWERTY key commands right from the Axiom Pro 25. Save settings to 50 memory locations—each with four profiles of quick recall via the intuitive graphic LCD. Now you can control your entire session right from your Axiom Pro 25. Thanks to revolutionary M-Audio HyperControl technology, your Axiom Pro 25 controller will automatically map to commonly used parameters of popular software instruments and digital audio workstations including Pro Tools, Cubase, Logic and Reason* systems. HyperControl updates the virtual instrument or track parameter mappings of each control in real time as you sequence—it doesn’t get any easier.